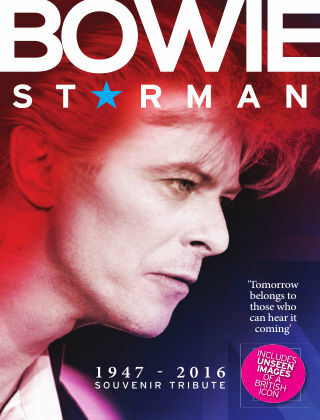 With Readly you can read Bowie Starman and thousands of other magazines on your tablet and smartphone. Get access to all with just one subscription. New releases and back issues – all included. A tribute to one of the world’s most influential, exciting and brilliant musicians. THE world of music has always enthralled, enchanted and entertained but there has never been a performer like David Bowie. Bowie was the master of re-invention; a theatrical, free-thinking complex artist; a man whose chameleon-like genius enabled him to survive at the top of the music business for generations. From Ziggy Stardust to The Thin White Duke, there has never been a performer as ahead of his time as Bowie and following the sad, shock news of his untimely death aged just 69, this 84-page special publication pays tribute to his astonishingly eclectic and thrilling career. From the critically acclaimed release of his latest album Blackstar to the story of his early years, we take a look back at Bowie’s emergence, the ups and downs, his personal and family life and the fame that followed him for four decades. Using the Mirror’s astonishing and unrivalled archive, this magazine features historic interviews with Bowie over the years plus a collection of rare and unseen images presenting a fascinating portrait of a unique Great British icon.